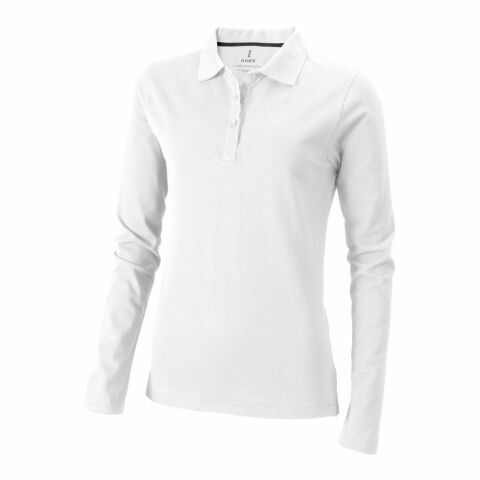 Backhand Short Sleeve Ladies Polo. Polo shirts are classic staples in a lot of people’s wardrobes. As part of school uniforms, they can also be used for work, as well as athletic activities. We have polo’s made predominantly from polyester, which is a fabric well known for its durability, this means the shirt can be worn and washed thousands of times without the shirt losing its shape. We also have long sleeve polo’s made from 100% cotton, for ultimate wearing comfort. For more warmth, there are polo style sweatshirt, which are stain resistant and feature a pen holder on the sleeve. All of these promotional clothing items are available to personalise by having your business logo printed or embroidered into the fabric. There is so much choice in this category, no matter what your marketing aim, there is sure to be a polo shirt to suit you. There are almost no designer labels that do not feature the polo shirt in their collections. The shirts, with their characteristic collar, and the typical button row is so versatile that it can be used as part of a sporty look, but works equally as well in an office setting. The polo shirt can be part of many different outfit combinations, and is sure to be in the closet of your customers, co-workers and business partners. This timeless classic combines everything you expect from an effective promotional product: Usefulness, aesthetics, and popularity. Show the fashionable side of your business, with these personalised polo shirts from allbranded. The relationship with your customer is vital for the success of the company. With small and large presents, you will strengthen the relationship with your target group, therefore achieving a high grade of customer loyalty. Printed polo shirts, branded according to your corporate design, will excite your customers and create positive associations with your business in their mind. Should your customers take a particular liking to these personalised polo shirts, they might wear them daily, which will increase the amount of corporate exposure made throughout the products life cycle. This way you will not only strengthen the relationship towards your customers, but also increase brand awareness. ‘See and be seen’ is a fitting slogan for promotional clothing. Polo shirts make the perfect gift, as the garment can be used for both casual leisurewear and also smart, business occasions. Just like custom printed T-shirts or promotional trousers Polo shirts can also be used for your employees or co-workers as part of their uniform. By having employees and students wear uniform, they will be filled with a sense of community in your company, and also strengthen the solidarity within the team. Regardless of which industry you are operating in, whether it is a café, an electronics store or a clothing store. It is especially good for customers, because they can easily identify employees if they are wearing uniform, and will know who to look for when regarding questions about goods and services. The simplicity of the polo shirt allows it to be the blank canvas for your creativity. We have short sleeve and long sleeve styles, a straight waist or the tapered version, we have premium 100% cotton shirts, but we also stock some with mixed fabrics. Once you have selected your style you can choose your preferred colour, which besides the classic black and white, includes many brighter colours too. Your business logo can then be printed or embroidered on the front, for maximum marketing impact. This can be done through silkscreen print, embroidery or flocking, depending on the kind of effect you wish to achieve. The competent allbranded customer service team will gladly advice you on any matter and help you create your unique product today.